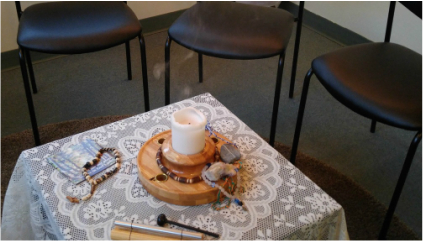 ​to join us on our journey"
A weekly meditation circle meets on Wednesdays at 10am from September-June in our meditation room. We spend time in both guided meditative reading and in 20 minutes of silent sitting meditation. Our sitting meditation practise is simple, and is based on the work of John Main, a Benedictine monk. Our guided reading rages from classic works like Meister Eckhardt, Hildegard of Bingen and St. Francis to Psalms to Celtic Christian writer John Philip Newell. We invite anyone who is interested or curious to join us. Meditation benefits us mentally, physically and spiritually and is a meaningful way to gather in community with others. For more information about Christian Meditation, visit the World Community of Christian Meditaton at the link below.